This beautiful church, with its once-famous/infamous Benedictine convent had close links to the Doges, who visited every Easter Monday. Said to have been founded in the 7th century by St Magnus, rebuilt in the 9th and the 12th centuries (when a fire killed a hundred nuns), it has housed the relics of St Zacharias, the father of John the Baptist, ever since the early 800s when they were donated to Venice by Byzantine Emperor Leo V. They're still there, in the right aisle. The present church was begun in retro-Gothic by Antonio Gambello in 1444 and finished in the Renaissance style of Mauro Codussi in 1515. Codussi is responsible for the distinctive Istrian stone façade above the level of the door, with lunettes and delicate seashell reliefs that cleverly disguise Gambello’s Gothic naves. One of the curiosities of Venice is that it's the only church front visible from the top of St Mark’s campanile. Inside, Codussi converted the original plans for a rib-vaulted ambulatory into an elegant ring of elliptical cupolas, lit by long narrow windows – northern Gothic in inspiration and common in France and northern Italy, but the only one of its kind in Venice. 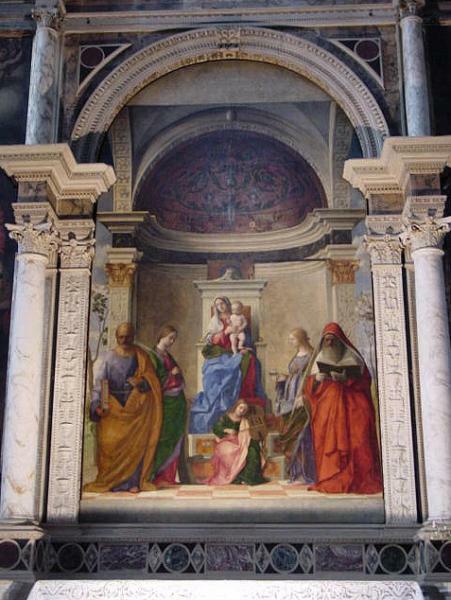 Paintings cover the walls, but the five-star attraction is Giovanni Bellini’s almost magical Madonna and Four Saints, also known as the Pala di San Zaccaria (1505) in the second chapel on the left. Painted when the artist was around 74, it is one of his finest works: large, riveting and luminous, the perspectives of the painted columns and arch are continued into the design of the frame to create a unique sense of depth, directing the eye towards a rare visual equivalent of the music of the spheres. The saints on either side of the Madonna’s throne, and the angel musicians below, are posed symmetrically, in a spiritual, self-absorbed dance; Bellini was one of the few artists capable of giving even the most common subject and composition new meaning – don’t expect as much from the 17th- and 18th-century artists whose canvases decorate the nave. Napoleon took the altarpiece (then painted on a wooden panel) to Paris, but after 20 years, in 1817, it was returned to the church and transferred to canvas, a laborious and delicate operation, necessary when the wood was warping or rotting, that involved planing off the wood from behind until only the paint and an infinitesimally thin layer of wood remained. It was restored again in 1971. At some point it lost a strip off its bottom that gave it even greater depth. Other works include, in the right nave, Niccolo Bambini's Adoration of the Magi (1712), one of his better works. At the end of the left aisle is the tomb and a self-portrait bust of Alessandro Vittoria (1528–1608), who also sculpted the headless figure of San Zaccaria over the main door, and the two saints of the holy water stoups. Near this is the entrance to the Cappella di Sant’Atanasio and Cappella di San Tarasio (adm). The first contains an early Tintoretto, the Birth of St John the Baptist, while San Tarasio chapel, actually the chancel of an earlier version of the church (with fragments of its Byzantine mosaic paving) houses three ornate ancone commissioned by wealthy nuns from Antonio Vivarini and Giovanni d’Alemagna in the 1440s. The one in the centre, a hyper-Gothic gilt extravaganza, features carved wooden saints with expectant faces, set into the frame as if seated in theatre boxes. In the fan vault above are frescoes by the Tuscan Andrea del Castagno of the same period, which, though sadly damaged, hint at how atavistic the Venetians were in the early Renaissance. 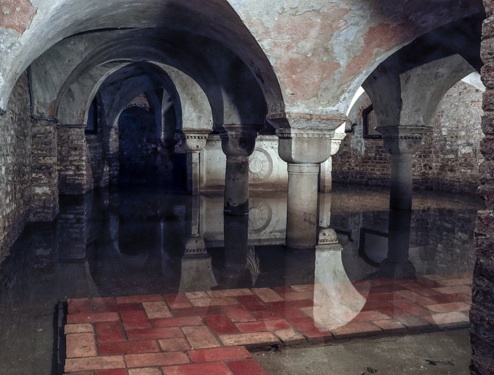 A stair leads down into the mystery-laden old crypt under whose flooded floor and pygmy vaults moulder the remains of eight doges. San Zaccaria and its Benedictine nuns enjoyed special ducal favours after the 12th century, when the abbess donated the convent garden to Doge Sebastiano Ziani; the nuns embroidered the ducal bonnets, and the Doge attended a special Easter Mass here. Although near St Mark's Square, this is a serene square, with its little garden of trees and cats, and nothing to recall the two doges who were assassinated here: Pietro Tradonico (864), who came to visit the nuns and pick up the very first distinctive corno ducale cap and was stabbed and left for dead in the Campo, and Vitale Michiel II, killed in 1172. As commanded on the old plaque at the entrance to the campo, you may not gamble, argue, curse or fight here, and you had better not throw any litter under the trees either. To the right of San Zaccaria is the brick patterned façade of its 13th-century predecessor church, used in winter by an Anglo-Venetian society for lectures. To the left of the church, part of its 16th-century cloister has homes built into the arches. At the southern end of the campo, in Sottocalle San Zaccaria, is a William-Morris-style palazzino with an eclectic relief of St George. If you leave the campo by way of Campo San Provolo and Salizzada San Provolo, look back to see the pretty bas-relief over its arch.